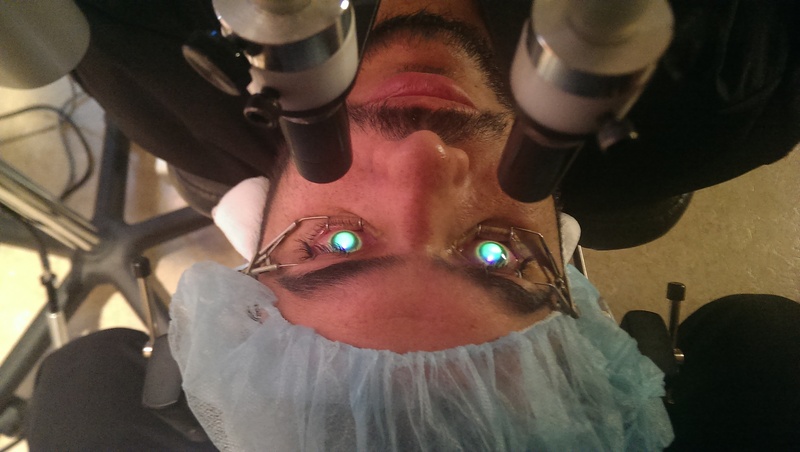 Cross-linking is a medical procedure that combines the use of ultra-violet light and riboflavin eye drops. Corneal cross-linking (CXL) is an in-office eye procedure that strengthens the cornea if it’s been weakened by keratoconus, other corneal disease, or (rarely) a complication of LASIK surgery. Alternative and brand names for the procedure include corneal cross-linking, corneal collagen cross-linking, C3-R, CCL and KXL. Collagen crosslinking involves removal of the surface corneal epithelial cell layer, saturation of the cornea with 0.1 % riboflavin for 30 minutes (1 drop is applied every 2 minutes) followed by application of UV light for 30 minutes. 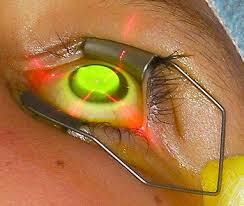 The corneal thickness needs to be over 400 microns for the procedure to be safe and effective. Collagen Cross-linking has been used for many years in the field of Dentistry. Corneal Collagen Cross-Linking with Riboflavin was first used in 1998 to treat Keratoconus. The technique was developed by Theo Seiler in Dresden. Treatments started in 1998, although initially only a handful were carried out each year, and it was not until a few years later that the Dresden clinic was treating over 100 patients per year with CXL. CXL works by increasing collagen ‘crosslinks’ which are the natural “anchors” within the cornea. These anchors are responsible for preventing the cornea from bulging out and becoming steep and irregular i.e like it is with keratoconus. OK- let’s start with two things. Firstly, Collagen cross linking is not a cure for keratoconus. This is not my opinion, it is a fact- anyone proclaiming it as a cure is being somewhat misleading. The NKCF agrees . Many people have now had CXL and it is indeed a promising treatment for keratoconus, that is worth investigating to see if it is suitable for you. What is CXL? Who should have it? So what is it exactly? CXL speeds up the ageing and hardening process of your cornea, thus reaching the point where your keratoconus would have stopped progressing naturally. So if you are 20, your cornea might then be about 25 years older than you- so to speak. It is for this reason that Moorfields set 40 years old as the upper age limit for their CXL trials (after 40 most corneas thicken naturally) A side effect is that it can be hardened and flattened at the same time. CXL is equivalent to lifetime progressive thickening of the cornea, so in theory this is a treatment that should only need to be done once. Furthermore the older you are the less likely it is that CXL will be of any use to you. Esteemed Consultant Ophthalmic Surgeons such as Samer Hamada believe that keratoconus is a childhood disease and as such the earlier you are diagnosed and treated with CXl to prevent the disease progressing, the better, this of course can also mean that you might avoid a corneal graft in later life. If you have been wearing RGP lens for 20 years and your KC is stable and is not progressing you are unlikely to be a viable candidate- although you would make the data look good. KC does stop progressing naturally, but it is up to you if you want to speed that up. Only 1 in 4 need a graft, the 3 in 4 have lens and glasses and manage brilliantly for life. That said if your KC remains unstable, again, CXL is worth investigating. The aim of this treatment is to stop the progression of keratoconus in mild or early stages, and prevent further deterioration in vision and with any luck- the need for corneal transplantation. Glasses or contact lenses will most likely still be needed following the cross-linking treatment (as your prescription may well have changed somewhat) but it is hoped that long term it might stop further deterioration of vision. The use of this procedure has gradually increased, with 1000+ centres around the world now performing this procedure in over 100 countries. The procedure has been refined over the years, with adjustments to the Riboflavin soak time and to the UVA light exposure time and energy levels. Corneal Collagen Cross Linking with Riboflavin is also known as CXL, CCR, CCL, C3-R and KXL. The Ophthalmic community is starting to see the benefits of prophylactic (preventative) treatment using Cross-linking and this procedure is now starting to be offered as a standalone procedure or in conjunction with corneal laser refractive surgery (PRK and IntraLASIK). There are currently 3 available systems that provide the UVA light source. The UV-X™ Illumination System is the most widely used system currently. Epithelium off, which means the thin layer covering the eye’s surface is removed, allowing for faster penetration with liquid riboflavin. Transepithelial corneal crosslinking (epithelium on) is where the corneal epithelial surface is left intact, which requires a longer riboflavin loading time. There are various schools of thought as to which version of CXL is ‘best’ depending on where you are in the world. There is controversy as to whether the top layer of cornea (the epithelium) should be removed before the Riboflavin is applied. The epithelium layer is designed to prevent water, chemicals and so on penetrating into the eye. It therefore acts somewhat like “waterproofing” but does allow some molecules to pass through, which is why drops such as antibiotic and steroid eye drops can be used. “Epi off” is favoured by most UK & European clinics as it is felt that penetration of the Riboflavin is most effective with this method. Epi-off crosslinking by definition is invasive. Your corneal epithelium is scraped off, like having a gigantic scratch on your eye which is painful and causes blurry vision during the healing phase. After CXL, the eye will be sore for 3 or 4 days, a bandage lens is worn and painkillers given. Patients cannot wear a contact lens for several months after the treatment. Another side effect is the significant vision changes for up to 6 months as your eye goes through healing with epi-off crosslinking due to the epithelium remodelling process that occurs after the epithelium grows back on the cornea surface. CXL does carry the risk of potentially serious side effects (infective keratitis, a risk of scarring on the surface of the cornea and a risk of haze). “Epi on” is favoured by some clinicians who feel they can increase penetration through the epithelium by combining the Riboflavin with other eye drops, such as Boxer Wachler- who renamed it Holcomb C3-R and says it is non-invasive – and that they have NEVER seen any of the above complications with it. However recent evidence tends to show that cross linking is more long lasting with epi off. This is why most clinical trials world wide use the epi off procedure. The epithelium heals very quickly after removal – overnight in fact. However, while it is healing, there is a certain amount of pain and sensitivity to light. Therefore epi on is a much more comfortable option, but may not be as effective long term. Any pain with either system can be controlled with drugs, of course. While crosslinking is used in virtually every country around the world, it is still in the FDA approval process in the United States. So after almost 20 years of study results and clinical records from the likes of the NHS in the UK, the evidence does suggest that CXL is proving to be of real benefit in improving the quality of life for some people with KC. As with any treatment you need tests and to see an expert in the field to ascertain whether it is right for you- before you part with as much as £2,000 in a private clinic or seek an NHS referral. CXL IS available on the NHS in the UK DESPITE what you may have been told by your GP or hospital practitioner. However it is not as yet WIDELY available, and it is all down to a. Funding and b, whether your Optom or surgeon has adopted it as not all have. So if you want it or at least more info you need to do your homework, and see where it is and ask for a referral- you may not get one of course. Privately various clinics offer it such as Optegra, Face & Eye Manchester and so on. If you live in Wales you may meet resistance from less than well, informed optom regarding CXL. It IS on the NHS and in Swansea, and you can be referred into England for treatment too. Fight! If you have early or mild diagnosed KC you may consider cxl. Some patients opt to have cxl not waiting for obvious signs of progression (vision changes/loss) and having two topographical tests 6 months apart to detect this progression. History of change of glasses/CL prescription or refraction over last year can be enough evidence to suggest that cxl would be worth doing. NICE Guidelines state that the KC should be likely to progress. It does not state that it should show progression – where some of these NHS clinics have come up with the ‘wait six months and see if it has progressed’ line is a mystery. It is not in any directive and the whole point of cross-linking is that progression can be slowed down. Fight your corner! NICE has released their guidance on collagen cross linking. The guidance advocates epithelium off CXL due to good evidence on safety and efficacy, in the UK. CXL is suitable for adults and children and is offered if indicated. The growing evidence means that patients in the UK should have access to treatment in the NHS without having to go privately. The Corneoplastic Unit at Queen Victoria Hospital in East Grinstead has been doing this under NHS for many years. Patients choice means that you can ask your GP to refer you to anywhere in the country for quality treatment- so if you want CXL or to learn more about it- speak to your GP or your optom for more information. Finally, in April 2016, the U.S. Food and Drug Administration (FDA) gave approval to Avedro Inc.’s corneal cross-linking system to treat patients with progressive keratoconus and post-LASIK ectasia, way behind the rest of the Western world, but good news regardless. Studies on corneal cross-linking go back more than a decade, and countries in Europe have offered their approved treatment for years. In the U.S., some doctors of optometry have been co-managing patients with cross-linking for years, informing them that it was “off label” and had not yet been approved in this country. The Avedro system is the first corneal cross-linking treatment ever approved in the USA. The cost of a corneal cross-linking procedure for keratoconus or corneal ectasia can range from $2,500 to $4,000 per eye. ACXL or Keraflex or KXL is Accelerated corneal collagen crosslinking, such as Avedro’s KXL system which reduces the UVA exposure time to less than 3 minutes. The Avedro KXL Accelerated Corneal Collagen Cross-Linking system has been approved in Europe and by Health Canada and other countries. The most used term for epi off corneal collagen crosslinking is CXL, usually referred to as the Dresden protocol, which includes removal of the corneal epithelium and UVA irradiation for 30 minutes. C-3R Holcomb or C3R, is the epi-on corneal collagen crosslinking method trademarked by Brian Boxer Wachler, MD, in 2003 in the USA. CACXL is Contact lens-assisted cross-linking, a newer technique for cross-linking in corneas less than 400 microns thick. Great post. For anyone considering cxl, though a short process, it is very unpleasant. I have advanced kc in both eyes and have had cxl done privately. It has not stopped the progression but has slowed it considerably – as suggested it would be my optho. Hi Kameel, thanks for posting. How is your vision? Do you wear lens? Thanks for your comment, appreciated. Ill add your blog address to our post about Keratoconus blogs. No problem! I think you already posted my blog address….thanks for that. It’s hard enough to keep up with my blog when my eyes are in recovery, so sorry for the delay in viewing your post. I’m following you, though! Sounds a bit odd. On the same eye? Why do cxl in a cornea that’s then removed? Or how could you do cxl on a brand new graft? Are you sure that’s what you’ve been offered? Your doctor should be able to provide studies related to CXL after a transplant/graft at the very least so you can make an informed decision. If not, and you are able, I’d get a 2nd opinion. Does anyone know if CXL can be done on post RK patients? My incisions in 1992 were very deep causing corneas to collapse,scar and weaken, plus KC. I cant wear medical lenses due to discomfort and was hoping this procedure would help.Thank you for any info! We have a member in our Facebook group who had RK and kc- this procedure is rarely carried out now and certainly not with kc patients. She wears hybrid lens have you tried these? It is unlikely you can have cxl but have you asked a specialist? I follow this blog and just a few things to add/expand on. I had to Google RK as I’d never heard of it (presume that is an outdated procedure now). I had bilateral CXL 8 mos ago and have had some complications as I found out that what caused KC midlife was really a genetic connective tissue disorder. When you mentioned the RK caused scarring and other problems, it just gave me pause as I thought other surgeries I had in the past (non-ocular) were botched, when really it was just my Ehlers-Danlos causing the issues, which was misdiagnosed for 12 yrs since I got sick. Just throwing this out there as food for thought, as I believe you developed KC later on (?) like me (sort of fits)–I don’t think you would have had RK with KC, but maybe the KC caused all the issues if you didn’t know you had it–like how LASIK and PRK are contraindicated. Has your KC burned-out? If so, the docs don’t recommend CXL past that point. Most people only get a few lines of VA back (I got a good amount), as it is just designed to halt the progression so if it’s not progressing, the European docs prefer to not cross-link, per journal articles I’ve read. I’m also lens intolerant due to severe dye eyes and still have low vision as a result. I would like to try scleral lenses (have you tried these–they can work for very damaged corneas and the dry eye crowd? ), but am worried I’m still fluctuating post-op as nothing is healing right. Regardless, I would see a GOOD corneal specialist familiar with KC and CXL, as I get hits on my blog of lots of post-op problems, when it’s touted as super safe. Feel free to drop by if this sounds at all like you (I blog on both disorders and am in the US, where CXL is in clinical trials). My son has keratoconus AND ehrlos danlos. We r considering crisslinking. Would u do it again? Personally I haven’t had cxl I turned it down as my kc was already stable. It seems that the best results for cxl come for young flat corneas in early stage kc. I think your comment was for me as I’m still following this thread and it came to my user name, but not sure? You can also contact me on my blog–there’s a link if you click on my Gravatar (eye). Lots of info on KC and EDS there (and rather wordy). Anyway, I had no choice as the KC just hit in my mid/late 30s or so and I was losing a line every 6 weeks on the chart and wasn’t diagnosed for 9 mos. I was down to the wire and luckily found a trial as I’m in the States. With EDS, we don’t actually have true keratoconus, even though the medical literature says that. We have secondary corneal ectasia caused by EDS. KC is primary corneal ectasia. One day I’ll post on that! It’s the same really (thinning of the cornea creating a cone), except how the disease progresses is often not and I personally do not believe it burns out like with normal KCers. Does your son have classical EDS because I’ve only seen 1 case in a journal article with a hypermobiity type and presume they were mis-typed. I do have classical/type II. Having said all that, I would have needed transplants (or “grafts”) and with the scarring, etc. I think that would have been a complete disaster. I can only assume the rate of rejection would be even higher as your my own connective tissue would be such a mismatch due to my faulty collagen. Ditto for Intacs, not that they stop the progression–scar city. With EDS, we also need to avoid steroids of all kinds as they further thin the connective tissue, so I would say CXL is all around better as I only did 21 days of ocular Pred. I did have every possible complication from CXL it seems and didn’t now I had EDS at the time (had a misdiagnosis), but what else could I have done? So, yes, I would do it again to prevent losing my sight altogether. With your son, I would expect a longer time for the epithelium to heal as we heal much slower. I used eye drops non-stop (moist areas heal faster) and taped my eyes shut at night once I hit 8 days or so and no healing. Make sure he is carefully monitored for central corneal opacities (central scars) for a full year as I have one in each eye and the one that was not treated (nor detected) is further skewing my vision. The treated one showed up at my 6-mo post-op. They can sometimes be treated with ocular steroids. The cornea in the eye with the permanent opacity was actually completely flattened by CXL (also not normal), and with no KC in that eye anymore, that’s now my bad eye and I still have KC-type vision from the scar. I had very dry eyes pre-op and now have no tear production (13 mos out) and I am contact lens intolerant due to that. So, expect a halt in progression (great! ), but complications as well. Maybe I’m a fluke, but I get scarring and problems from all surgeries due to EDS, so I doubt it. Best of luck to your son! I’ve never met anyone with EDS and KC before. Again, surgery is always a last result with EDS, but if it comes to losing your vision, then the benefit outweighs the risk in my opinion. i have kc and i made cxl from 9 months ,now the vision still weak so it’s available to me to do keraflex ? I already wore a contact lens after cxl until now and vision still very eeak it improve slightly . So I asked made cxl before . Pervent me from make keraflex ? I can’t see why you need keraflex when you’ve had cxl already – both are for stopping Keratoconus from progressing. It sounds like you need to investigate better contact lens options. There are many types to try. Intacs may also be an option to flatten your cornea and make wearing lenses easier. Try to find a good lens fitter who’s an expert in Keratoconus lenses. Would you recommend corneal cross linking for a 43 year old with ectasia?